I have been using a canvas food pack for years, but last summer I decided to try the Traditional Food Pack by Granite Gear. To be honest, I was not expecting much, boy, was I wrong. 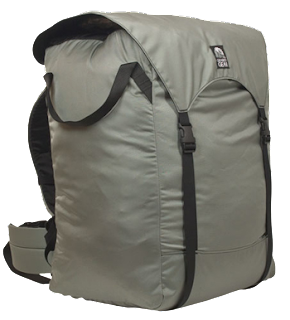 This food pack is made out of 210D Nylon Cordura, which is very light, compared to traditional canvas. It also has padded shoulders straps and belt that make for a comfortable fit. I have always been told that a hip belt is nothing but a nuisance on a trip into canoe country, but let me tell you that it was an added comfort and help when traveling on some of the longer and more treacherous portages last summer. Another great feature of this pack is the two handles for lifting the pack in and out of canoes, a feature that is missing on some of the canvas packs I have used. There is also a drawstring cord at the top of the pack for easy access to your food. I put a cardboard beer bottle box on the inside of the pack to help sort my food and some nylon bags to sort other food items, which works perfectly. Overall, this Traditional Food Pack by Granite Gear Rocks! This pack is surely going to replace my canvas pack that I have been using and will be a welcomed comfort on portages in canoe country.